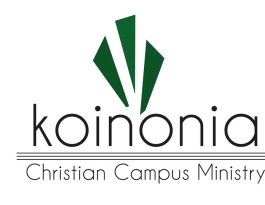 Koinonia begins its 47th year serving MSSU with many changes. Our Tuesday meetings are averaging around 50 and we have 5 Thursday night Bible studies going. Over 150 have attended one or more of our events. Campus ministry is vital to keeping young adults who grew up in the church active. Studies show that students who remain active in church ministry during their college years most likely will stay involved throughout the rest of their life.